The third oldest settlement in South Africa, Paarl is steeped in history and culture. But there’s far more to it than that! While the town is close enough for a day adventure – just an hour’s drive from Cape Town – you’ll probably want to make a weekend of it. The Paarl Golf Club dates back to 1908, so it is not surprising that folks in the Paarl-Franschhoek valley take the sport pretty seriously. Boschenmeer Golf Estate, which is home to the golf club, boasts the first 27-hole championship golf course in the Western Cape. Once you’ve played all 27 holes, head over to Pearl Valley, which forms part of the Val de Vie Estate. At Pearl Valley, you’ll find a pristine Jack Nicklaus Signature Golf Course. Since 2006, Golf Digest magazine has consistently ranked this as one of the top ten courses in South Africa! The Paarl Wine Route, which is the second oldest in the country, is known for its full-bodied spicy reds and crisp whites. Shiraz is the most important varietal from the area, but Paarl wineries also produce remarkable chenin blanc, chardonnay, pinotage, viognier and mourvedre. Be sure to check out Under Oaks, Nederburg Wines, KWV Wine Emporium, Fairview, Black Pearl Wines, Boland Kelder, Ridgeback Wine Farm and Rhebokskloof Wine Estate. Stop for a lazy lunch at the Grande Roche Hotel or at Harvest at the Laborie Wine Estate. Once you are done tasting the wine at Fairview, be sure to sample some of their delicious cheeses. While Fairview also produces cow’s milk cheese, it is famous for its goat’s milk variety. The Saanen goat’s milk is supplied by a resident herd of over 1000 goats and you’ll find a couple of them frolicking in an enclosure near the tasting room. Be warned: you are likely to leave with more cheese than you can stomach in one sitting… or even a week! Dalewood Fromage, on the Klapmuts-Simondium Road, sells a range of specialty cheeses – including brie, camembert, and the uniquely South African Huguenot – made from Jersey milk and produced on the estate. In your quest for all things cheesy, be sure to pop in to Three Ladies Cheese at the Goedemoed Farm. Here you’ll find a range of light semi-soft cheeses with black pepper, herbs, and cumin and mustard, and a delicate cambrieni. Remember all that history we mentioned earlier? Here’s what you need to know. In 1657, a chap called Abraham Gabemma set out from the Cape in search of resources. On his journey he came across a giant granite rock gleaming in the distance. He called the mountain Pearl Mountain, and the town that grew at its base eventually became known as Paarl. This big rock is fairly significant as it is the second largest granite outcrop in the world. Unless geology is your thing, a trip to Paarl Rock would seem a tad boring were it not for the monument erected on it. The Taal Monument, which was designed by architect Jan van Wijk in 1975, is a celebration of the Afrikaans language. At the time rather futuristic, the monument, which acknowledges the languages that contributed to the development of Afrikaans, is unexpectedly beautiful from the inside. Free guided tours are available daily. 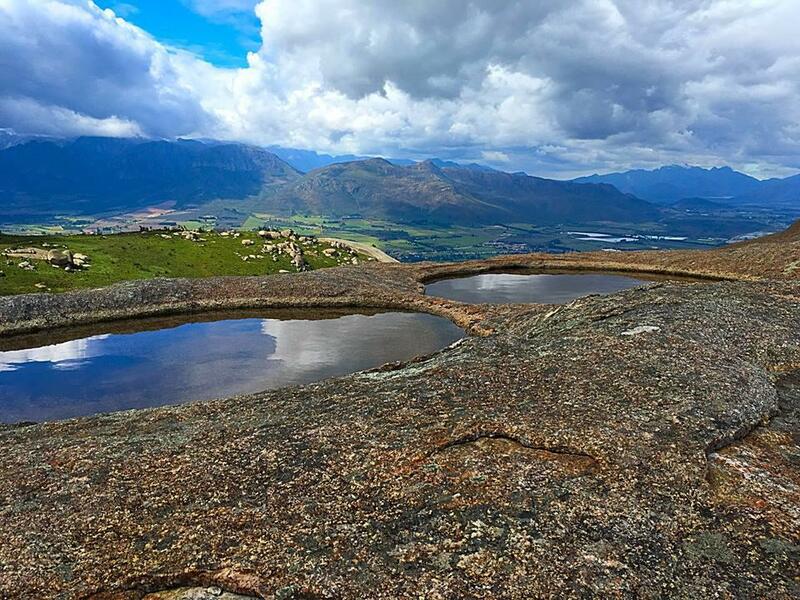 Whether you are traversing the Paarl Mountain Nature Reserve or exploring the Arboretum along the Berg River, this little section of the Cape offers up some spectacular scenery. One of the best ways to take it all in is on a mountain bike. There are numerous routes, of varying degrees of difficulty, in and around the Paarl Mountain Nature Reserve. There are also routes that take you around some of the picturesque wine farms. Check out some of the routes here. If you don’t own a bike, you can hire one (delivery and collection included) from Dirtopia. Spice Route is reason enough to head to Paarl for the day. With two fabulous restaurants, a coffee shop that serves homemade ice cream, a winery tasting room, a distillery, a cured-meats deli, a chocolatier, an art studio, a glass-blowing studio, and a shop filled with hand-crafted treasures, Spice Route is a little village all on its own. It also happens to be home to the Cape Brewing Company. Under the watchful eye of brew-master Wolfgang Koedel, CBC has quickly become one of the country’s favourite craft breweries. In 2014, 45,000 visitors flocked to the brewery to discover where and how the magic happens. Indulge in all four of the key CBC brews – pilsner, lager, krystal weiss, and amber weiss – at the Barley & Biltong beer garden, whilst tucking into a selection of beef, kudu, eland, and springbok biltong. If you’re after a few new brews, try the Berg River Brewery on the banks of the Berg River in Paarl. Chat to the owners Glenn and Shaun about the niceties of brewing while sampling their helles lager, blonde ale, kristel weizen, and pale ale. Somerset West is known for three things: wine, food, and adventure….